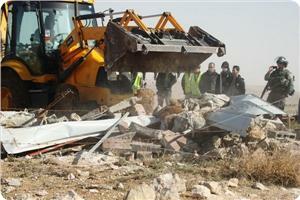 Bulldozers demolished three houses and a well in the Bethlehem town of al-Khader on Wednesday, witnesses said. Locals told Ma'an that two Israeli bulldozers, escorted by Israeli police, raided the town and demolished three properties belonging to Ali Salim Moussa and Ismail Mahmoud Moussa, leaving six families homeless. 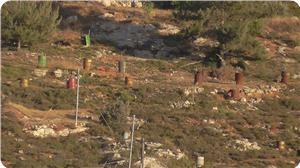 Israeli forces also destroyed a water well in the village during the raid. 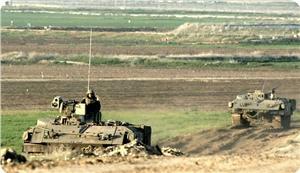 Israeli occupation forces (IOF) launched a limited incursion into southern Gaza Strip on Wednesday morning, local sources said. They told the PIC reporter that four military bulldozers escorted by IOF soldiers advanced into south east of Khan Younis city, south of the Gaza Strip. The sources said that the bulldozers leveled land along the border fence while heading northwards toward Khuza’a town. Israeli warplanes launched a series of air raids on Gaza Strip over the past few days causing a number of casualties and vast destruction in houses and property. The Israeli Occupation Forces (IOF) demolished on Tuesday Palestinian stores and facilities in al-Khalil and a home in Idna town as part of Israeli military operation progressing along the past six days. Local sources said that Israeli soldiers escorted military bulldozers that demolished stores and facilities belonging to Palestinian citizens, amid tight restrictions, in Farsh al-Hawa suburb in al-Khalil city, while continuing their arrest and raid campaign in the same neighborhood. Along the same line, IOF demolished a Palestinian two-story home in Idna town, west of al-Khalil, under the pretext of being built without permit. On the other hand, Palestinian citizens were prevented from passing though Container checkpoint near Bethlehem. Eyewitnesses told the PIC reporter that IOF soldiers manning the Container checkpoint prevented residents of al-Khalil from passing through it, which led to traffic jams in the area. The sources added that Israeli soldiers intensified their presence at the military checkpoint since the morning hours. Meanwhile, Israeli arrests against Hamas leaders and activists continued in al-Khalil as the IOF soldiers intensified their presence throughout the province similarly to the invasion carried out during the second intifada (uprising). IOF soldiers stormed on Tuesday al-Khalil from its different entrances and broke into Sheikh Fawzi Khatib’s home and carried out search operation in the surrounding areas to the house. Khatib’s three sons were arrested during the raid and taken to detention centers. Eyewitnesses said that Israeli soldiers were deployed in different parts and neighborhoods in the city and took control of two homes to use them as watchtowers. 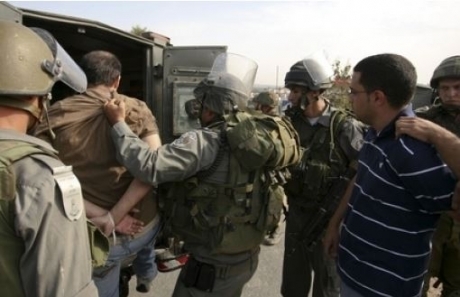 40 Palestinians were arrested during the raid and arrest campaign that continued till dawn Tuesday throughout the West Bank. Around 250 arrests were reported during the three past days including cadres and leaders in Hamas movement, liberated prisoners, and minors. Israeli forces continued their closure of all entrances to al-Khalil for the fourth day in a row and prevented its residents’ movement. 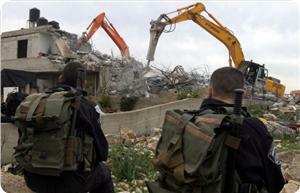 Israeli bulldozers early Tuesday demolished a Palestinian home in the Hebron town of Idhna, a local official said. 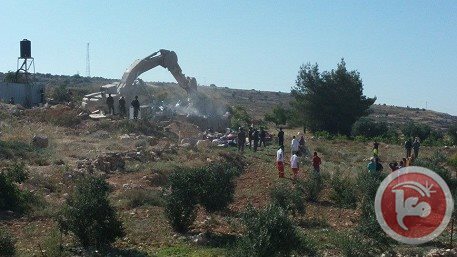 Idhna mayor Hashim Tmeizi told Ma'an that bulldozers escorted by Israeli forces arrived in the Khirbet al-Ras neighborhood of the village and demolished a two-story house. The residence, which belonged to Muhammad Hussein Farajallah, measured 200 square meters and housed a family of six. A spokesman for Israel's civil administration told Ma'an the house was constructed "illegally," without responding to requests for further details. The Israeli military continued its massive invasion and arrests in different parts of the occupied West Bank city of Hebron, and so far kicked out three Palestinian families from their homes, to use them as military posts, and even to sleep there. Resident Saleh al-‘Oweiwy said the army kicked out three families, including his own, and the family of his brother, and informed them that the soldiers will be sleeping there. He added that the families, under gunpoint, had no other option but to leave, especially amidst threats by the soldiers to use force against them, and even to shoot them if they do not leave. Another family was also forced out, and dozens of soldiers occupied their home to use it for sleeping, and to turn it into a military post and a monitoring tower. The army also occupied ‘Ayesh as-Sayyed School, west of Hebron city, and used it as a military base. 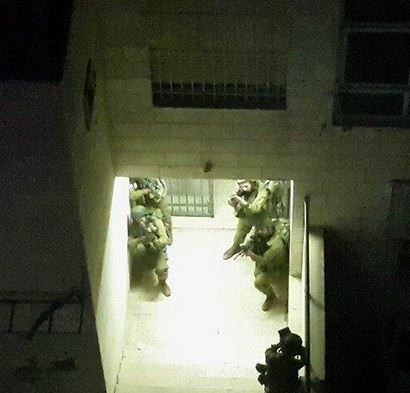 On Monday at night, dozens of soldiers invaded the al-Jenan neighborhood in the central West Bank city of Ramallah, and searched several homes. 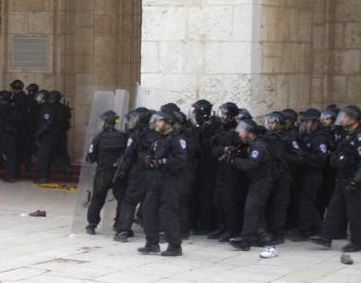 Soldiers also invaded Anata town and Shu’fat refugee camp, in occupied Jerusalem. In related news, a number of fanatic Israeli settlers fired rounds of live ammunition at Palestinian cars driving near Beit Rima town, north of the central West Bank city of Ramallah. Damage was reported, no injuries. Eyewitnesses said the settlers came from Halamish illegal settlement, built on lands illegally confiscated from residents of Nabi Saleh and Dir Nitham villages. As the army continues to search for three missing Israeli settlers, dozens of Palestinians have been kidnapped by the soldiers who broke into and searched hundreds of Palestinian homes and property, in Hebron, Bethlehem, and different Palestinian communities in the occupied West Bank. The army also kidnapped the elected head of the Palestinian Legislative Council, Dr. Aziz Dweik, along with legislators Bassem az-Za’arir and Azzam Salhab. In addition, soldiers shot and killed a young Palestinian man in the al-Jalazoun refugee camp, north of Ramallah, injured at least two Palestinians and kidnapped several residents. Israeli bulldozers on Monday destroyed two structures in al-Eizariya village east of Jerusalem, the owner of the buildings said. 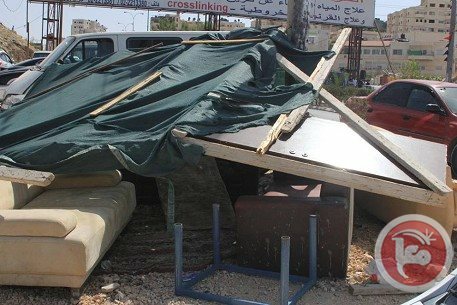 Sami Abu Ghaliya told Ma'an that bulldozers accompanied by Israeli forces entered al-Eizariya and demolished his produce market and his car wash, located at the entrance of the village across from the Maale Adumim settlement. The car wash was a 150-square-meter structure, and the produce market was 70 square meters large, Abu Ghaliya said. He estimated that the buildings had cost him 80,000 shekels to construct, adding that Monday marked the fourth demolition of structures he owned within the last five months. Israeli forces rarely grant Palestinians permits to build in the occupied West Bank, and regularly demolish homes and other structures in Areas B and C.
Israeli forces on Thursday demolished the Bedouin village of al-Araqib for the 70th time, witnesses told Ma'an. 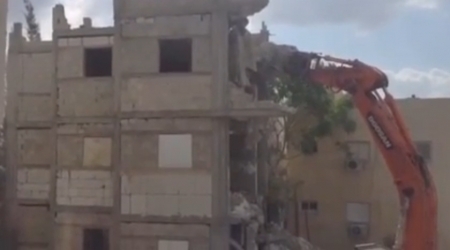 demolished under the supervision of Negev deputy police chief Elan Peretz. 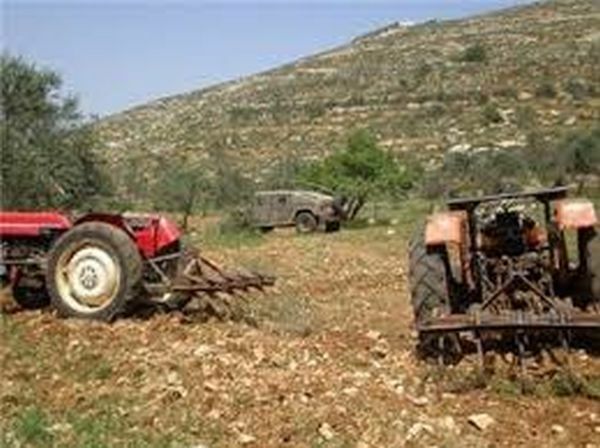 Israeli Occupation Forces seized around four agricultural tractors west of West Bank city of Jenin. The Palestinian security sources reported that at least four tractors have been seized by the Israeli forces in the villages of Yamoun and Borkeen west of Jenin. The forces are still looking for more tractors in other villages. Israeli municipal teams escorted by police forces demolished at dawn Sunday a Palestinian home consisting of three rooms, and leveled an area of 20 dunums in Shefa Amr north of 1948 occupied Palestine, Palestinian sources reported. 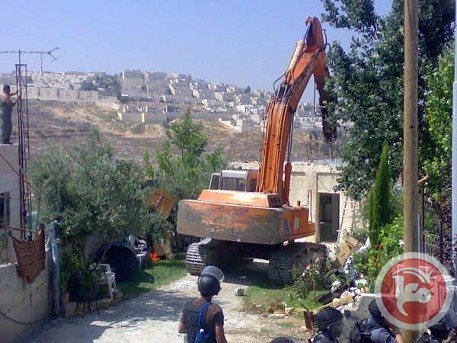 The house owners said that Israeli bulldozers razed their home and destroyed several trees in the surrounding area under the pretext that the land did not belong to them but rather was “state owned”. The family stressed that they have papers and documents proving their ownership of the house and the surrounding land since 1955. 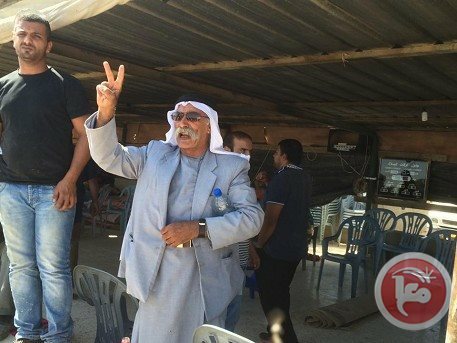 Meanwhile, a state of tension has prevailed in the neighboring town of Sakhnin when Israeli authorities issued a demolition order against a home belonging to the citizen Barakat Hayadera. Israeli soldiers kidnapped at least nine Palestinians in different parts of the occupied West Bank, kidnapped eight Palestinians, and confiscated around 80 computers from two stores in Tulkarem. Local sources in Hebron, in the southern part of the occupied West Bank, have reported that the soldiers invaded the al-‘Arroub refugee camp, north of the city, and kidnapped six Palestinians. The six have been identified as Khaled Jibreel Jawabra, Zakariyya Nabil al-Qeeq, Salah Hasaniyya, Imad Khaled al-Jondy, Malek Abu Haikal Jawabra, and Mahmoud Ziad al-Mezyen, the Palestinian News & Info Agency (WAFA) has reported. Soldiers also invaded ‘Atteel town, north of the northern West Bank city of Tulkarem, and kidnapped a Palestinian identified as Mahmoud Abu Shams, 29. They also invaded two computer stores Abu Shams owns in the town, and in Tulkarem city, and confiscated at least 80 computers and monitors, in addition to large sums of cash. Eyewitnesses said the army smashed and destroyed several computers, being repaired in the stores, and destroyed the main gate on a nearby trade bank. On Sunday at night, dozens of soldiers invaded the al-Yamoun town, west of the northern West Bank city of Jenin, and kidnapped a university student, identified as Aseed Jihad Nawahda, 20. Nawahda was taken prisoner at a sudden roadblock the soldiers installed on the main Jenin-Nablus road, south of Jenin. The army also installed a roadblock at the entrance of Ya’bad nearby town, stopped and searched dozens of vehicles, and examined the ID cards of dozens of passengers. Several Israeli military jeeps, and a number of armored bulldozers, invaded the Far’oun town, south of the northern West Bank city of Tulkarem, and demolished one home. Head of the Far’oun Town Council, Mohyeddeen ‘Atteer, stated that dozens of soldiers invaded the southern part of the town, approximately at five at dawn, and demolished a home for “its close proximity to the Annexation Wall” illegally built by Israel in the West Bank. ‘Atteer added that the two-story home, owned by Falah Suleiman Obeid, was recently completed, following two years of construction and furnishing. Last year, Israel ordered him to stop the construction, but he continued the work to shelter himself, and his twelve family members. Obeid is blind, and suffers from a kidney disease and diabetes; the family was supposed to move into their new property within the coming few days. Bulldozers of the Israeli Municipality demolished on Saturday a four- story building owned by Abu Ghanem family in Ramla city in pre- 1948 occupied Palestine. The municipality claimed that the house was built with no permit. 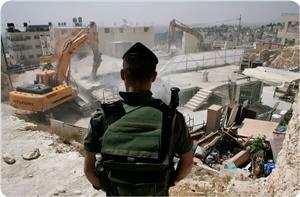 The locals tried to stop the bulldozers but a large Israeli force prevented them. The Arab member of Ramla municipality, Hassan Abu Obeid, told "Safa agency" on Sunday the demolition is a systematic Israeli policy to displace the Palestinians from their neighborhoods in the city of Ramla. The procrastination of the Israeli municipality of not issuing permits and destroying the house directly proved that the permission is only an excuse, he added that. Nayef Abu Ghanem, the owner of the house, confirmed that he tried to obtain a license through the Israeli courts, but it was in vain. 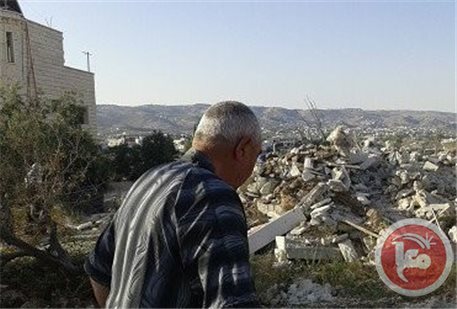 A chain of Israeli bulldozers demolished a Palestinian four-story home owned by the Palestinian citizen Nayef Abu Ghanem in al-Jawarish neighborhood in al-Ramla, north of the 1948 occupied Palestine, under the worn-out pretext of illegal construction. “Though Saturday happens to be a public holiday in all corners of the so-called Hebrew state, the bulldozers of the Israeli municipality, along with a large number of Israeli police, invaded the city and blocked it before ordering the family to keep away throughout the demolition procedure,“ local sources in the city reported. “The misdemeanors of the Israeli municipality coincide with a strange paradox meant to just crack down on the Palestinian civilians, who have been making every possible effort to get construction permits. The result is an arbitrary demolition issued in such an arbitrary and unexpected manner,” Abu Ghanem’s homeless family added. The house owner revealed the countless occasions where he has appealed to courthouses to attain the necessary authorization to build a home for his wife and soon-to-be-wedded children. But all of the appeals have been turned down. The bulldozers stormed the city and reduced the entire building to mere rubble. Al-Ramla, among many other cities, has been subject to Israeli illegal settlement and bullying procedures aiming at just coming down heavily on the Palestinian native citizens and denying them the right to set up roots over their own and only native soil.